Mildred Pauline Yeager, age 84, of New Market passed away in Frederick on Thursday, Nov. 1, 2018 surrounded by her loved ones. Born on St. Patrick's Day, March 17, 1934 in Sugarloaf Mountain, MD, she was the daughter of the late Daniel Thomas and Mildred Nora Fogle. 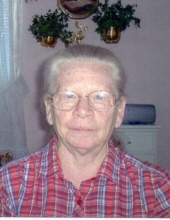 She was the wife of George Thomas Yeager, Jr. who died in 2003. Mildred was the center of the family unit. She was the loving caregiver and nurturer for those who needed her. As she grew older that role was taken on by her son Paul. He lovingly cared for her until her final breath. Mildred is survived by her sons, Thomas Allen and wife Shelly of Louisiana, Michael Wayne and wife Karla of Boonsboro, Paul Eugene of New Market and Robbie Joe and wife Amy of New Market; grandchildren, Michael Yeager Jr., Jennifer and husband Richard Moore, Noah Randell Yeager, Zachariah Yeager; great grand-children Shayla Yeager, Hailey and Riley Moore. Mildred was predeceased by her son George Daniel Yeager. The family will receive friends at Hartzler Funeral Home, 404 S. Main St., Woodsboro from 6 to 9 pm Tuesday, November 6. To send flowers or a remembrance gift to the family of Mildred Pauline Yeager, please visit our Tribute Store. "Email Address" would like to share the life celebration of Mildred Pauline Yeager. Click on the "link" to go to share a favorite memory or leave a condolence message for the family.